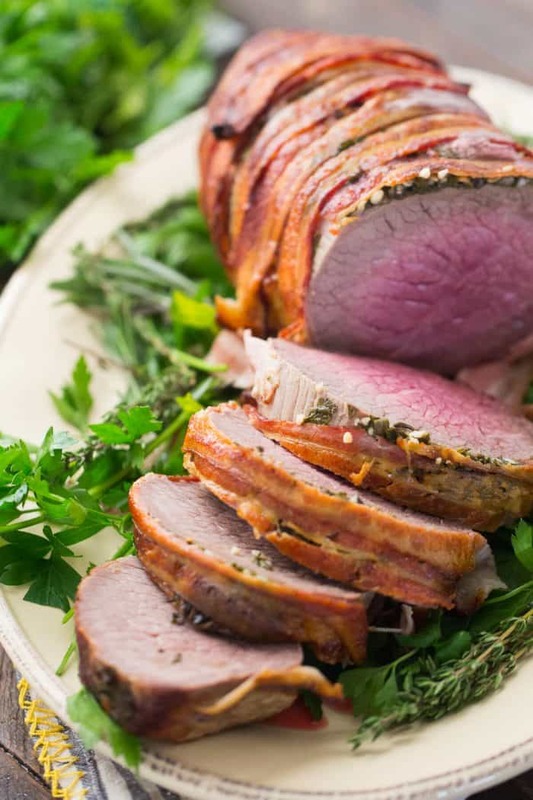 A good beef roast can make any occasion special! 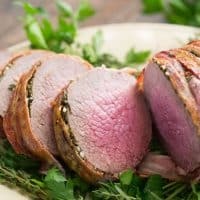 Eye of round roast is an economical alternative to many cuts, but when you surround the roast with herbs and bacon, you get a main dish that looks stunning and sophisticated! I have partnered with the Ohio Beef Council to bring you this original recipe. When I think of the Christmas meal, I think of the Grinch and how he carved the roast beast. If I weren’t hosting the family for the holidays, I’d probably just make a giant plate of pretzel bites or oven baked pickle chips for Christmas and call it a day. But you can’t serve snacks for dinner, and since the best gift you can give your body is a healthy diet, a roast is in order. 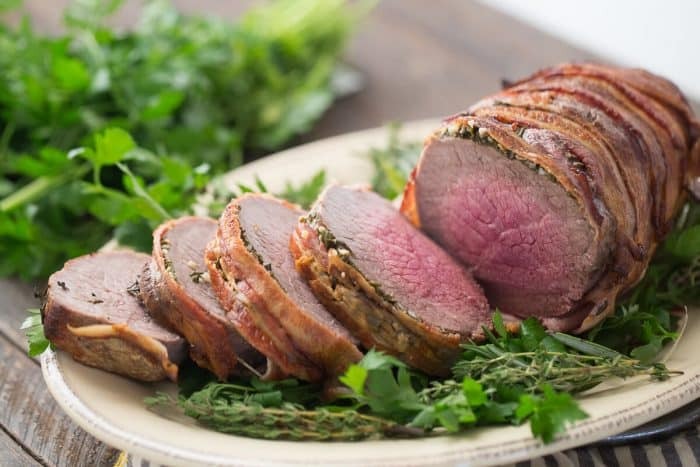 Beef provides 25 grams of protein and 10 essential nutrients all wrapped up in one tasty package! That is hard to beat. Prime rib and standing rib roasts are succulent and beautiful, but they can be a little more than I want to spend. I asked my local butcher for an economical replacement, and he suggested using an – round tip, top sirloin, or eye of round roast. I chose the eye of round; this lean cut of beef is ideal for the bacon that will be accompanying the roast! To prepare this company worthy beef, combine fresh herbs and garlic in a bowl then arrange this mixture over the top of the roast. Arrange bacon strips so the ends overlap on the center of broiler pan. Place the beef on top of where the bacon meets and wrap the rest of the bacon over the beef, tucking any excess under the beef. In just about an hour you will have tender beef that has been flavored with herbs and crispy bacon. I took my beef out of the oven when a meat thermometer registers 125 degrees. If you want your beef to be served medium, then allow it to roast until the thermometer reaches 135 degrees. Be sure to allow the beef to rest when you remove it from the oven. 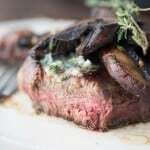 This beef is exceptionally simple to prepare, but it is juicy and perfect. It is exactly what should be served on those special occasions! 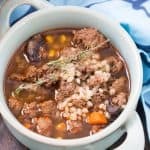 This hearty beef and barley soup is perfect for these cold, winters nights! 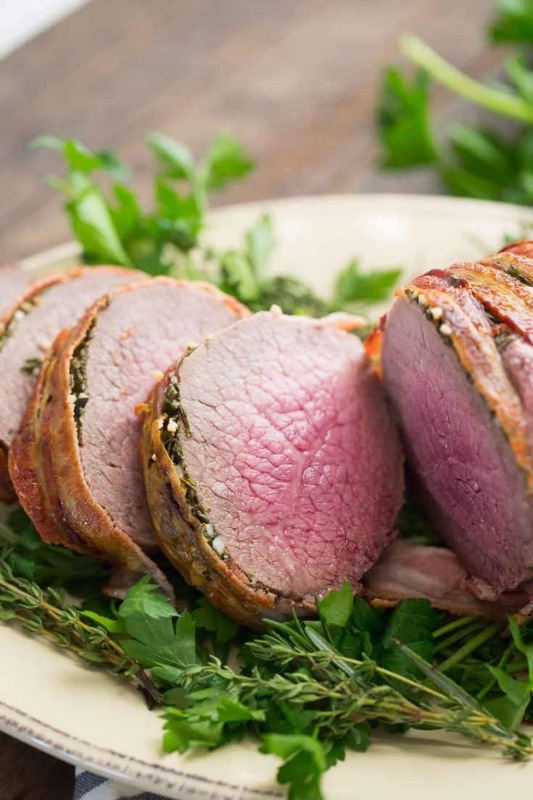 Get ready for some real sophistication with this mushroom and herb topped beef tenderloin! 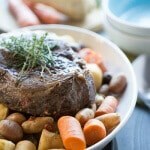 Let the slow cooker take care of dinner with this easy pot roast recipe! There are 17,000 beef farming families in Ohio, and 98 percent are family farms. Watch this video series from the Ohio Beef Council to see how Ohio beef farmers change their animal care routines as the weather gets colder. 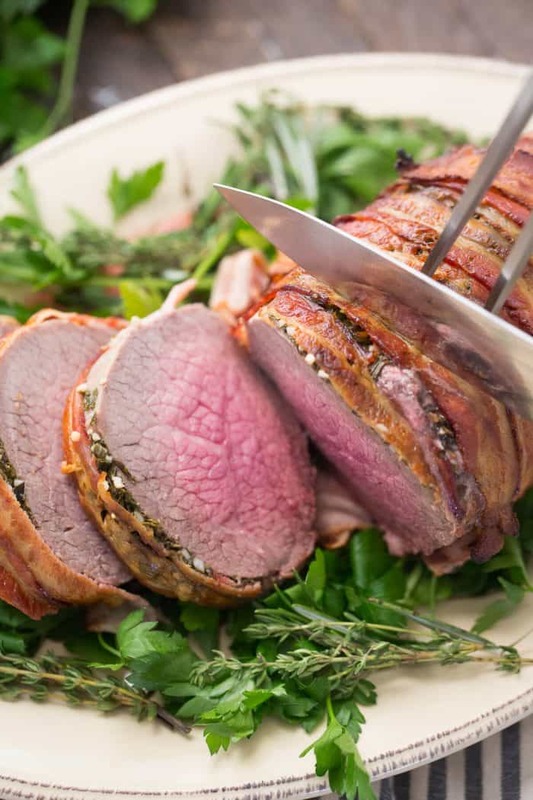 A juicy roast that features freshly cut herbs and crispy bacon! In a bowl combine chopped parsley, rosemary, thyme and garlic. Arrange bacon on a broiler pan; cross the ends of each piece of bacon so that they make a bed for the roast to lay on. 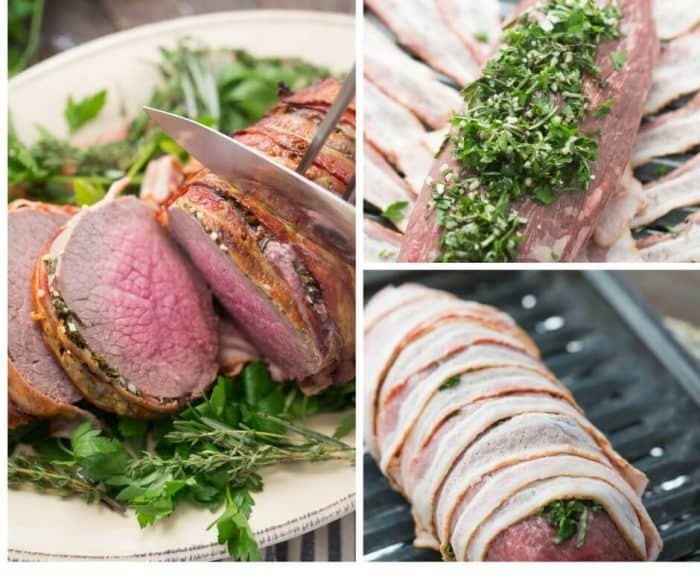 Arrange the beef on the crossed bacon ends and place herb mixture over the top of the beef. Take the fanned out bacon ends and place them over the beef, tucking any loose ends under the beef. Roast the beef for 55-60 minutes or until a meat thermometer stuck in the center registers 125 degrees for rare, 135 for medium rare. Remove the roast and allow it to rest for at least 10 minutes before slicing. the roast is beautiful, but the bacon kicks this dish into high gear! yummy! The presentation of this roast is so lovely!! WOW! I am not a big fan of roasts, but I think with some horseradish infused mashed potatoes on the side, I would be a huge fan of this!! 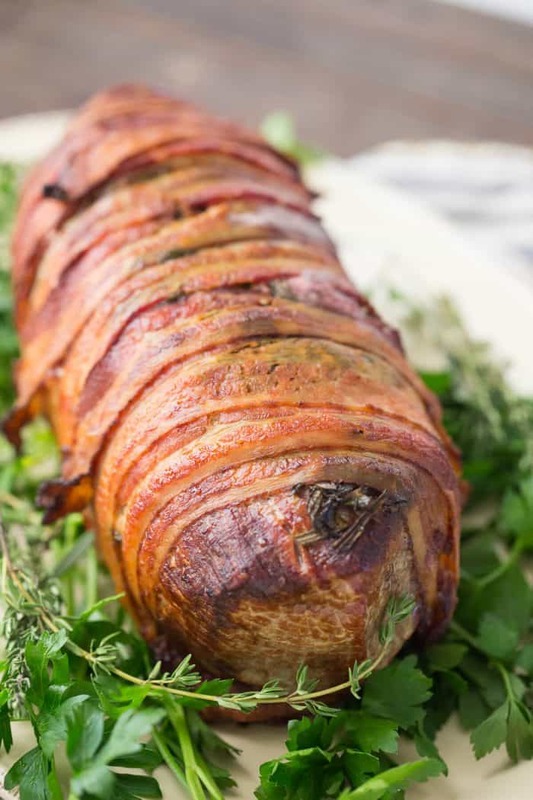 Genius wrapping those herbs around the roast and securing with bacon! Love! This looks so amazing! You had me at “bacon wrapped”! Love the herbs in there, so much extra flavor! Such a beautifully presented roast. The temperature is perfect! Merry Christmas. YES. wrap it in bacon and you’ve got flavor for days! looks delicious! What a great recipe! I love that you wrapped it in bacon! Whoa friend! You should be proud, this look amazing! This recipe is incomplete as your website does not give a clear direction for how much parsley. Too bad. Sounds good but the recipe is incomplete. 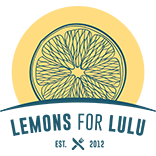 Sorry about that there is a glitch in my recipe card, it doesn’t always recognize the quantity 1/3, however, parsley is a mild herb and you can easily allow your taste and preference to be your guide.